Rogue River Rafting with O.A.R.S. 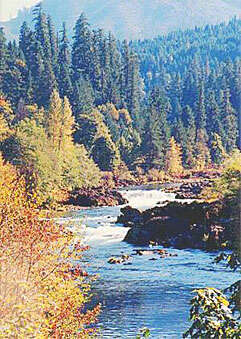 Upper Rogue River Rafting trips is conduced in the river area running from Shady Cove to Gold Hill. Here the Rogue River runs over gravel bars and bedrock for about 30 miles with numerous access points to launch. Most all Upper Rogue River rafting runs can be made in 2 to 4 hours. Shuttle service and Rafting Rentals are available in Shady Cove and Gold Hill. Rapids are rated rafting class 1 to class 3, with a good amount of wildlife and nice scenery. This area provides good family rafting fun with time left in the day for evening plans. Rafting Outfitters and Rentals center at Shady Cove on Hwy 62 between Medford and Crater Lake National Park. Great camping for this area is found at Rogue Elk Park run by Jackson County Parks and Stewart State Park near Lost Creek Lake. Middle Rogue River Rafting for family day trips. 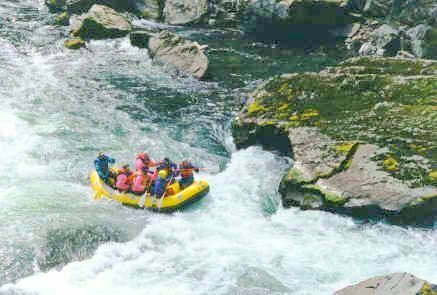 Middle Rogue River Rafting trips are conduced in the river area running from Gold Hill to Galice, this area is one of the best areas for a family day rafting trips. Day rafting trips will run 6 to 15 miles per day with several deep and scenic Canyons like Hellgate Canyon and Taylor Canyon. A rafting trip to remember can be done in a day here. Summer rafting water temperatures will be in the mid to low 70’s with air temperatures of near 90 degrees. A great location to camp for Middle Rogue River Rafting is Indian Mary Camp Ground run by Josephine County located between Merlin and Galice. Rafting Outfitters and Rentals center around the small community of Merlin and Galice near Grants Pass and to a lesser extent Gold Hill both are just off Interstate 5. Rogue River Rafting Family Rafting Trips with O.A.R.S. The Rogue River Canyon ranks in the top 10 of Whitewater Rafting vacations in the United States. People come from the world over to vacation in Oregon and go on a Rogue River Canyon rafting trip. The United States Congress set the Rogue River Canyon section aside in 1968 as a special national treasure. Named as one of the original Wild and Scenic Rivers the Rogue River Canyon is the best of Oregon Rafting. Most Rogue River Canyon Rafting trips are 2 to 4 days to make the 45-mile journey from Galice Oregon to Foster Bar. Rafting Outfitters center around the small community of Merlin and Galice near Grants Pass, Oregon. These trip must be book in advance as they fill up readily. Klamath River Rafting Family Rafting Trips with O.A.R.S. 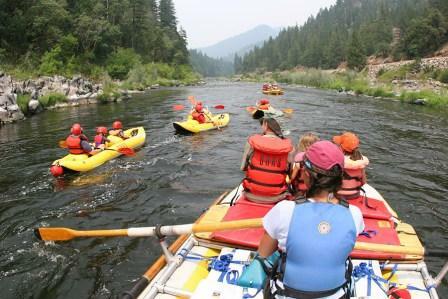 Both rafting and kayak enthusiasts are drawn to the Klamath River for the scenic beauty of the Klamath River. The North Umpqua River will challenge all Oregon rafting enthusiasts, with great whitewater rafting rapids. The North Umpqua River is rated from Class I to Class V rafting rapids. Oregon rafting guides are permitted by the BLM and USFS to provide Umpqua River rafting trips to the public. 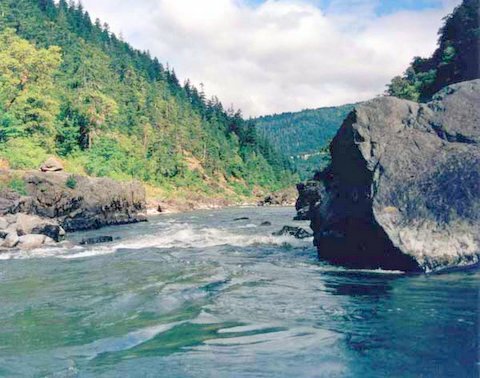 Best months for the North Umpqua River are May, June and into July, depending on weather. Easy River Rafting. Small waves, regular river passages clear. Easy River Rafting. Medium difficulty rapids, with clear river passages. Medium difficulty river rafting. Numerous waves, high; irregular rocks, eddies; whitewater rapids with clear passages that are narrow, requires expertise in manuvering; scouting advised. Difficult Rafting. Powerful waves with long rapids; boiling eddies, dangerous rocks; scouting passages difficult; scouting mandatory for first time passage; precise maneuvering required with powerful flows. Generally considered un-run-able except with covered or specially equipped boats.